Three Reasons Concrete Fails | Adriatic Restoration Corp. When it comes to reliable building materials, concrete is one of the most time-honored. Resistant to deformation, durable, long-lasting and cost-effective, it is a top choice for commercial applications. But even this king of all building materials isn’t quite invincible. 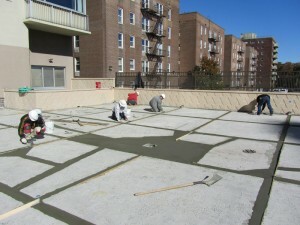 Concrete can fall prey to failure and when that happens, concrete repair is inevitable. What can cause your sturdy concrete parking deck or your gleaming concrete floor to crack or spall? Here are some of the top reasons concrete fails. When people think of causes of concrete damage, nature is typically at the top of the list. The main threat comes via freeze-thaw cycles. In cold climates, concrete is exposed to water via rain or snow, then, when temperatures drop, the moisture freezes. The ice creates pressure as it expands, leading to cracks in the concrete. Concrete in commercial structures is designed with specific load limits in mind. Those limits are based on everything from the density of the concrete, placement of reinforcement bars and more. When too much weight or other stress is put on a concrete structure, failure is inevitable. Cracks can be caused by tension, cyclic loading and more. However the damage is caused, concrete repair is the result. One of the lesser-known causes for concrete damage involves sulfates. In some instances, sulfates – common in soaps – seep into groundwater. This sulfate-rich water can get into concrete, where the sulfates react with cement elements, breaking them down. The resulting erosion weakens the concrete over time, causing the need for concrete repair. Concrete is diverse and flexible, durable and reliable. It’s the ideal choice for everything from freestanding buildings to building elements like stairs and parking lots. But its strength has limits. If your concrete structures are showing the signs of damage by these or any other means, consider concrete repair to make them like new again.